With an A+++ -10% energy efficiency rating and time-saving features, the Bosch WAN28000GB is perfect for busy households with an eye on their energy bills. Bosch knows that no single day is the same, and that includes doing the laundry. That’s why they have created VarioPerfect – allowing you to choose between saving time or energy. If you’re not in a rush, select EcoPerfect and reduce power consumption by up to 50%, compared to the same programme without EcoPerfect. Or, when you need your clothes in a hurry, choose SpeedPerfect to reduce laundry time by up to 65% – allowing you to do a full load in just one hour. ActiveWater technology detects the load weight and uses only the right amount of water for each wash, using a two-step automatic load adjustment system. No more wasting water and no more using energy to heat unneeded water. Energy saving features such as these, as well as others, mean the Bosch WAN28000GB has an impressive energy efficiency rating of A+++ -10%, meaning it uses 10% less energy than a standard A+++ machine. With 15 programmes to choose from you can be sure there is one for your load, no matter the colour or fabric. Cotton is the most used fabric in clothes and Bosch has made it quick and easy to select the right temperature for yours. With an option of nine different cotton cycles, based on temperature, there is no need to adjust the settings to get the perfect programme. Specialist programmes, such as wool, delicates and dark wash, automatically adjust the wash settings to ensure your clothes get an excellent clean while being gentle on the fabrics. Once you have selected your programme, use the large LED display to adjust the spin speed, check a cycle’s finish time or set a delay of up to 24 hours. Give your clothes the spa treatment with the 3D AquaSpa wash system. Water enters the drum from three sides for faster penetration into the fabric. The specially designed paddles then ensure a gentle wash and optimum usage of the water. 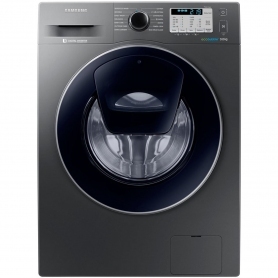 Anti-vibration side panels and the EcoSilence Drive brushless motor keep the WAN28000GB at a quiet 54 dB during the wash cycle – that’s about the same level as a normal conversation. Add or remove items from the wash once the programme has started thanks to the handy ReLoad function and, as the whole door opens, you aren’t restricted as to the size of the items you can add. 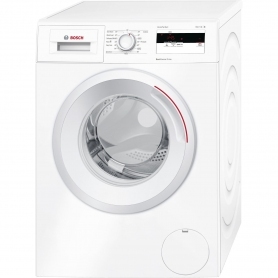 The Bosch WAN28000GB is a highly efficient washing machine that can save you both time and money – buy yours today.